There is a science to making an ice cream cake..I did not know this until this week. Even if you are like me and decided to construct vs actually make the cake (and by make I mean create your own ice cream vs buying whatever brand is on sale at the grocery store) there is a lot of work that needs to go into this. Things like I did not know that you cannot melt the ice cream because it will refreeze into a different consistency..so softened ice cream is good..melted not so much. I chose to use slightly softened ice cream and to mash into the pan I used to mold it. The other important piece of information is before you even begin this project..make sure you freeze the cake pan you are using for a couple of hours in the coldest part of your freezer to insure it is nice and cold. Once the pan (I used a spring form pan) is cold line it with parchment paper to make it easier to remove the molded ice cream at the end. after you spread the cookie crunch and cover it with plastic wrap and refreeze for about 2 hours to set you add the top layer of ice cream. My son does not enjoy many ice creams beyond vanilla or vanilla with caramel mixed in so I opted for a layer of carame swirl and a layer of vanilla. The top layer took a while to freeze but once it was done I was able to “frost” the cake with a layer of cool whip and then put it back in the freezer to set again..then came the decorating part..and here is where not only my inexperience with decorating showed but also my laziness. 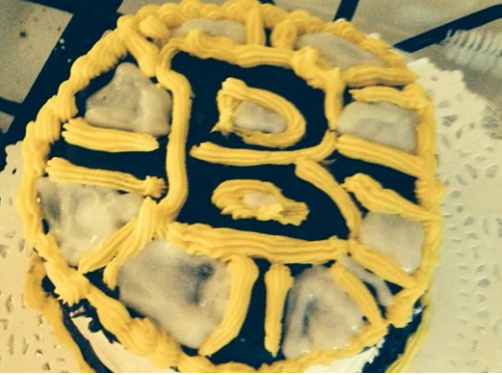 Did I mention the boy is a HUGE Boston Bruins fan?